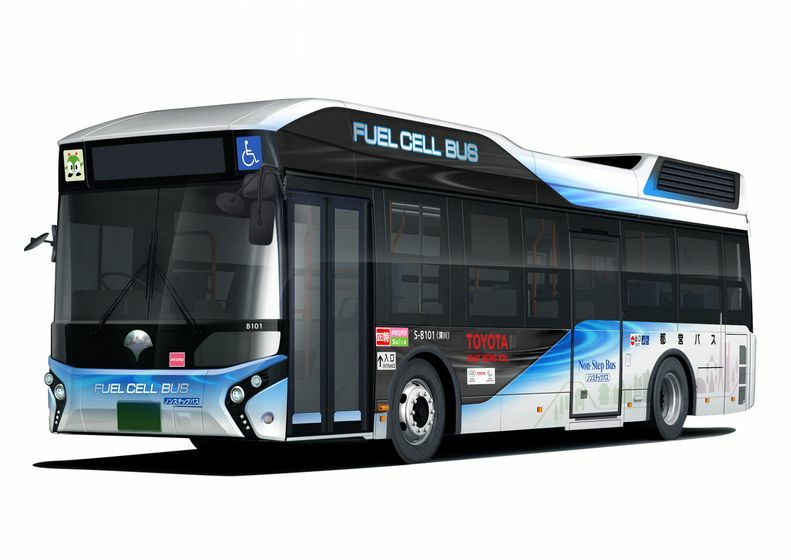 TORONTO, ON, February 24, 2017―Toyota Motor Corporation delivered the first fuel cell bus (FC bus) sold under the Toyota brand to the Bureau of Transportation of the Tokyo Metropolitan Government. This FC bus (model name: Toyota FC Bus) will be put into operation as a Toei route bus in March along with a second bus that is scheduled for delivery in the same month. Toyota plans to introduce over 100 FC buses mainly within the Tokyo area, ahead of the Tokyo 2020 Olympic and Paralympic Games. The increased use of FC buses in urban areas is expected to help raise the level of understanding by the general public regarding the use of FC buses as a form of public transportation. The Toyota Fuel Cell System (TFCS) 1, which was developed for the Mirai fuel cell vehicle (FCV), has been adopted to provide better energy efficiency in comparison with internal combustion engines, as well as to deliver superior environmental performance with no CO2 emissions or Substances of Concern (SoC) emitted when driving. In addition, the FC Bus is compliant with Non-Step Standards2, making for easy boarding and exiting by elderly people and young children. The bus also uses a high-capacity external power supply system. With a power supply capable of a 9 kW3 maximum output, and a large capacity of electricity supply at 235 kWh4, the FC bus can be used as a power source in the event of disasters, such as at evacuation sites such as in school gymnasiums5 or, its electricity supply can also be harnessed for home electric appliance use. Development and demonstration tests of the Toyota FC Bus were conducted under the Next-Generation Energy and Social Systems Demonstration Project6 of the Ministry of Economy, Trade and Industry (METI) and the Low Carbon Technology Research and Development Program7 under the Ministry of Environment. It was then introduced under the Program for promoting low carbonization of local transportation8 of the Ministry of Land, Infrastructure, Transport and Tourism (MLIT). The Toyota Group considers the use of hydrogen to be a powerful source of energy for the future. 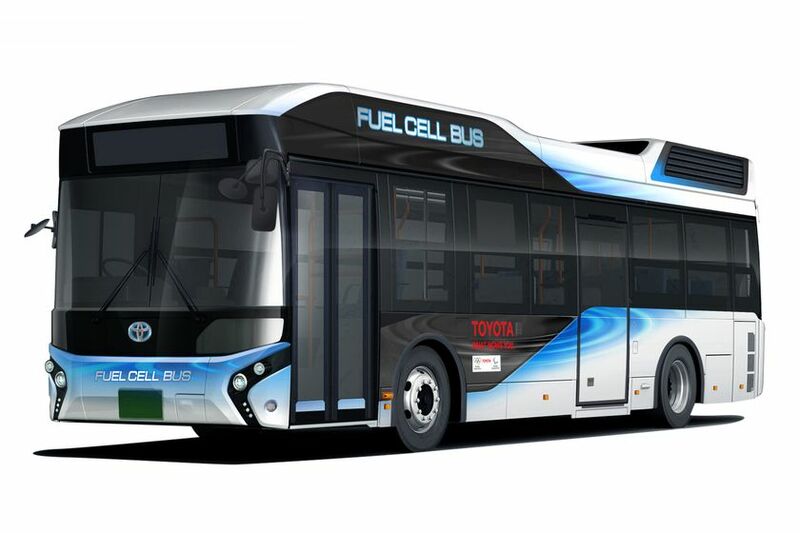 Toyota has launched the Mirai FCV, while also engaging in the technological and product development of FC buses, fuel cell forklifts, as well as stationary fuel cells for use in homes. Going forward, the group will accelerate developments in a unified manner, so as to contribute to the realization of a hydrogen-based society. 1 A system combining hybrid technology with fuel cell technology composed of Toyota FC stacks and high pressure hydrogen tanks etc. 2 Barrier-free buses that satisfy the Standard Specification Non-Step Bus Certification Guidelines specified by the Ministry of Land, Infrastructure, Transport and Tourism. 3 Possible electric power varies depending on the performance of the power supply unit. 4 After DC/AC conversion by power supply unit. Power supply capacity varies according to power supply unit conversion efficiency, amount of remaining hydrogen and power consumption. 5 Requires wiring work at the facilities. 6 Support for regions that set high targets for creating next-generation energy and social systems and undertake advanced initiatives and are selected as Next-Generation Energy and Social System Demonstration Regions. 7 Support from the Ministry of the Environment for development and demonstration of CO2 emissions reduction technologies with the aim of achieving drastic reductions in CO2 emissions. 8 Support from the Ministry of Land, Infrastructure, Transport and Tourism to motor carrier enterprises and other businesses for the introduction of electric buses, taxis, and trucks, fuel cell buses and taxis, and ultra-compact means of mobility. Toyota Canada Inc. (TCI) is the exclusive Canadian distributor of Toyota, Lexus and Scion vehicles. Toyota has sold over 5 million vehicles in Canada through a national network of 287 Toyota, Lexus and Scion dealerships. Toyota is dedicated to bringing safety, quality, dependability and reliability in the vehicles Canadians drive and the service they receive. TCI’s head office is located in Toronto, with regional offices in Vancouver, Calgary, Montreal and Halifax and parts distribution centers in Toronto and Vancouver. Toyota operates two manufacturing facilities in Canada. Having produced more than six million vehicles, popular Canadian models built at these facilities include Toyota RAV4, Toyota Corolla, Lexus RX 350 and RX 450h hybrid.